With an increase in popularity of low-carb and Keto diets, cauliflower rice has taken center stage. This healthy side dish is the perfect compliment to almost any meal and with only a fraction of the calories and carbs. 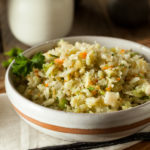 Cauliflower rice made into fried rice. An healthy side dish that tastes great! Yes, cauliflower rice still has carbs, but only 5 carbs per 1 cup of cauliflower. And if you are counting calories, cauliflower rice has only 25 calories per cup versus brown rice which has 218 calories. That is why so many people are turning to cauliflower when they are craving a rice based meal. It’s a much healthier alternative to traditional rice. In fact, you can now find prepackaged cauliflower rice in most grocery stores. You can find it in the fresh packaged aisle near the produce section or also in the freezer section. 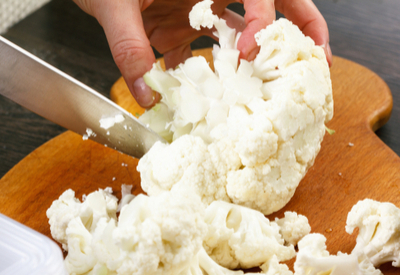 Cut your head of cauliflower into similar sized florets before putting in the food processor. 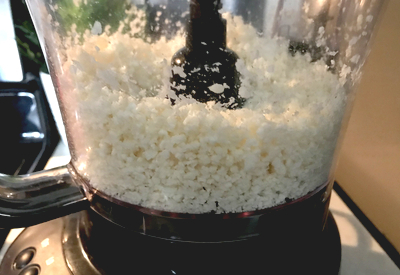 However, I prefer to make my own cauliflower rice using our Hamilton Beach Duo Food Processor. This food processor is a life saver when trying to eat healthier. It chops and grates vegetables so quickly that it is a breeze to make a healthy meal in minutes. We even use it to make our own ground chicken from fresh chicken breasts. All you need to do is cut off the florets and pulse them in the food processor until they resemble rice. I prefer to do this in small batches with similar floret sizes to get consistent results. We use our Hamilton Beach Duo Food Processor to make our rice. Add a little oil to a skillet and cook until tender. That is it! To spruce things up a bit, sometimes I will make fried cauliflower rice. Add in a little carrots and peas and drizzle a little soy sauce (or coconut aminos) and in minutes you have a fantastic side dish! 1 pound of cauliflower will make approximately 4 cups of rice. And for those who like to meal prep ahead of time, you can make it and refrigerate or freeze for later use! A low-carb alternative to standard rice that can be used in recipes or as a stand alone side dish. Cut cauliflower into similar sized florets. In small batches, place florets into a food processor and pulse until the cauliflower resembles rice. Remove any larger pieces and put back into the food processor and pulse. Heat a skillet to medium-high heat. Add olive oil. Once heated add the cauliflower rice and cook for approximately 5-7 minutes until tender, stirring frequently. Serve immediately or store in the refrigerator or freezer for later use. 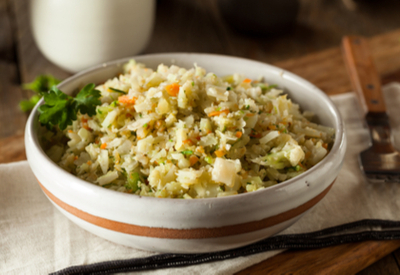 Option: Add diced carrots and peas to the skillet with the cauliflower rice. Drizzle with 1-2 tablespoons of soy sauce (or coconut aminos) for fried rice. Add in an egg for extra protein if desired. Could you make this in a Instant Pot cauliflower and white rice, how much time would you give it, Thanks. Hi Keith Are you wanting to make cauliflower rice in the instant pot or cauliflower and rice?